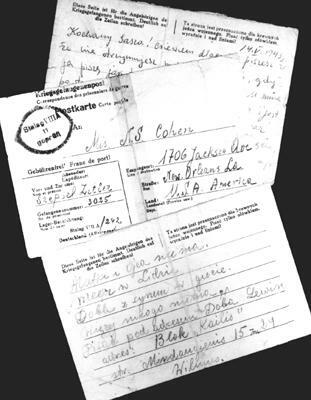 Holocaust Survivors: Photo Gallery - "Postcards"
Postcards Shep Zitler received as a Prisoner-of-War at Stalag VIII B from his sister Doba. The bottom postcard, dated September 16, 1942, reads: "Mother and Father are no more. Meer is in Lidris. Doba and little child are in Ghetto. There is no one else. If you want to write 'Doba Lewin address: Blok Kailis' Street Mindaugievis 15 m 24 Vilnius."